Olathe North's Venus Triplett. 810 Varsity. The following is a completely subjective look at some of the top returning players in the Sunflower League. As is the usual disclaimer, top talents emerge every fall who were relative unknowns heading into the season. There are also plenty of talented players who aren't listed below simply because I only included a top five at each position. Combined for 2,209 yards of total offense and 19 touchdowns in '13. Increased emphasis on accuracy could produce big senior season. Versatile athlete gained comfort on the varsity as a starting cornerback in '13. Impressive freshman production (1,478 passing yards, 12 touchdowns) should improve. Third-year starter has the necessary experience to rally the Pioneers into the playoffs. Powerful and compact senior seeks to become Olathe North's seventh Simone winner. 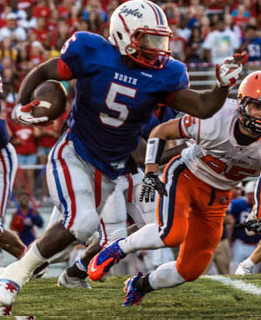 League's fastest running back will be heavily leaned on to produce big numbers this fall. Strong and athletic running back will get the lion's share of the carries for Cougs. Agile tailback who should excel in Lawrence's zone-read schemes. Rushed for 618 yards and three touchdowns after becoming starter midway through '13. Led the Sunflower League in receiving yards (843) and receiving touchdowns (8) in '13. Fourth-year starter can stretch a defense as well as any receiver in the league. Big target at 6-4, 210 pounds, who saves his best moments for the brightest spotlights. Speedy athlete may become the league's best slot receiver this fall. 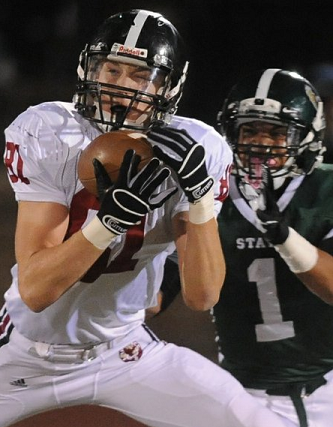 Steady receiver has been a staple on the Sunflower League scene last two seasons. Physical specimen who should be able to dominate as a blocker and pass-catcher. Prototypical tight end will be the Falcons top target in the passing game. Heralded junior should see offensive touches increase substantially. Sunflower League's best offensive lineman has no problem blocking to the whistle. Mobile tackle who plays and moves more like a tight end than an offensive lineman. Athletic guard who plays low and is excellent at putting his hat on a defender. Third-year starter who could be the best offensive lineman among the Olathes. Strong left tackle who can drive defensive lineman into the secondary. Sunflower League Defensive Player of the Year returns after 28 tackles for loss. Just scratching his potential, big-time junior holds four FBS offers. Mobile and strong, will be key in anchoring D-line in front of outstanding linebackers. Size and speed will make him one of the league's elite pass rushers. Tough-nosed defensive end will look to bounce back from an ACL tear last fall. Tenacious defender is a tackling machine, with a 37-inch vertical and 4.6 forty. League's best outside linebacker is athletic enough to cover the entire field. Savvy junior showed a nose for the football in '13 and brings toughness to young team. Solid tackler (118 tackles in '13) excels at moving laterally to chase down ballcarriers. Dependable linebacker who will be at the core of the Falcons' defensive efforts. Eagles' best defensive back since Dustin Moomau already holds multiple FBS offers. Hard-hitting safety who plays like a linebacker in run support. Wiry senior might play the ball out of the air better than anyone in the league. Could be the league's best defensive back in one-on-one coverage situations. Savvy secondary athlete who plays excellent coverage over the top. Took home First Team All-Sunflower League honors as just a sophomore in '13. Connected on four of six field goal attempts last season. LHS can attest to the benefits of having a (good) kicker, perhaps more than anyone. Rangy defensive back found a way to get in on nine turnovers in '13. Top returning linebacker was in on seven turnovers and two blocked kicks last fall. Athletic linebacker created five turnovers and a defensive touchdown as a junior. Converted five interceptions to 157 yards and one touchdown as a sophomore. The quickest secondary player in the league has snagged nine career interceptions. Eleven of 25 rushing touchdowns scored in '13 came on runs of 30 yards or longer. Dynamic dual-threat will be league's toughest quarterback to game plan around. Tailback can turn the corner on any defense with legitimate speed in the 4.4 range. Has shown the ability to produce big play after big play the past three seasons. Jitterbug is tiny at 5-6, 155 pounds, but might be the league's most elusive back. Offensive tackle has FBS interest; finally out from under Braden Smith's shadow. Coming off an impressive junior campaign, could take his game to another level. Quarterback friendly offense could mean a big season's in store for the signal-caller. Should build on excellent junior year to be one of league's outstanding defenders. Hawks' offense will be geared towards running behind Hinson. Could place himself among the league's best defensive lineman by mid-season. Will tote a big workload with the graduation of backs Luke Taylor and Mitchell Tyler. At 6-0, 195 pounds, has the tangibles to be league's most physical cornerback. Has potential for big senior season after injury shortened junior campaign. Big defensive end prospect has garnered chatter; will be put to the test this fall. I've said it before and I'll say it again. Olathe North might have the best O-Line overall going into this season. Tyler Bacon is definitely the biggest and strongest but I believe each guy is capable of taking on any d-lineman in the league. Center might be the only question as they have to replace three year starter Sean Ceballos. A couple of things here...and let me first say, great job, as always, Eli. 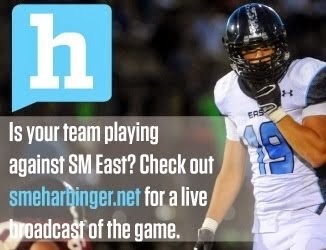 The offensive line for SME should be very good, at or near the top of the league. It returns all 5 starters from a team that averaged 250 rushing yards per game. and that was on the heels of literally learning an entire new (and entirely different) offense during the summer. I look for them to be the best unit on the team. Eli mentioned Sam Huffman as a sleeper and i couldn't agree more but i'd also include Jackson Gossick. While neither may have the speed of Tyler or the raw power of Taylor or Carter, they each had very impressive yards/carry averages last year and could become another 2-headed monster for league defenses to deal with. Besides, Ball, the other D lineman, Sam Williams, had a solid year, and along with the potential emergence of Jr. Jack Carter in the middle should make the D line a solid unit as well. I literally can't wait for Sept. 5th! Like the SMEaster, I can't really comment in depth outside of FS. Everyone on the list should feel honored about being mentioned. Congrats to all! Easy to see why only a few FS guys are listed. Not many have had the chance to produce at the varsity level yet, so most would fit in the sleeper category. I see some solid running and d-backs, receivers and lineman, especially, that will have great seasons. Looking forward to seeing the FS Boys of Fall! Go 'Birds!